Honor the life and work of Dr. Zelma Watson George (1903–94). Dr. George was a sociologist, musicologist and performer who broke the color barrier on Broadway in 1950. 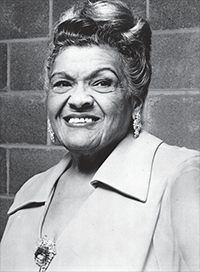 She came to Cleveland to research African-American music using the resources at the Cleveland Public Library in the 1940s. A table-top exhibit of materials will be on view in Special Collections from March 25–October 28, 2017. For more information call Special Collections at 216-623-2818 or email special.collections@cpl.org.